Validating ideas is easy. Building products many people love and serving customers exceptionally well is the challenge. 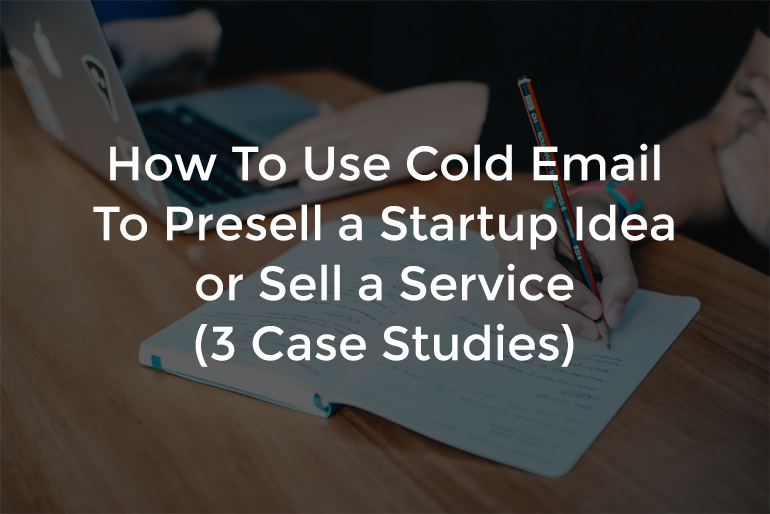 In this post, you will learn how to use cold email to quickly validate ideas through sales and presales. It isn’t until many people with similar needs pay you for your upcoming product or service that you can confidently label your idea “needed” or “worth solving”. In this guide, I am going to use three recent case studies from three ventures I helped three entrepreneurs start. The three ideas focused exclusively on sales since day one, an approach I found over the years saves the most time and leads to the highest outcomes: revenue and sufficient validation or a big red flag, that is, don’t proceed. Let’s start with services. As you’ll see in Jan’s example below, the best and fastest way to find and define your service is by looking at your personal experience, background and interests. In his years of corporate experience, Jan helped different types of organizations recruit and retain top talent. This is what he still does today. So, does this mean Jan should consider offering recruiting services? It’s an option but not the only option. Speaking with Jan, I learned his passion: lead generation. After all, his job is to spot potential recruits and then approach them with strong reasons why they should consider the company he is working for. Lead generation is broad and can be applied to different fields for different goals. After a brainstorming session, we decided to test the hypothesis: many small to midsize U.S. based companies seek the talent of European professionals in the programming and design space for cost efficiency and talent acquisition reasons. We hypothesize that European web development and design agencies need help acquiring U.S. based clients. And that becomes our service: helping European, German and Ukrainian, teams acquire U.S. clients through a done for you cold email lead generation service. In section 2, you’ll learn why we decided to focus on these two countries. Rule of thumb: if you’re not sure what service to offer, always begin by evaluating your skills. You may have goals to expand to other areas, offer different services and build a big company. That’s fantastic but you risk thinking too big that you can very easily end up doing nothing. Start by leveraging your own experience to get to market quickly and generate revenue for the things you already know and have spent years acquiring. As you’ll see below, with some guidance, it took Jan 3 weeks to go from idea to first paying customers. Let’s talk about startup ideas. Startups are very different from service-based businesses. When you’re launching a technology startup, you focus on finding and validating a business model whereas in the case of services, you are executing on an already validated model. Take the example of Jan. Companies have been paying for lead generation services for centuries. He’s not reinventing the wheel, he’s offering his services to get the wheel rolling. Startups require a great deal of testing, iterations, pivots, speed, and money. It is for this reason that many startup founders begin their startup ventures by offering services before creating a scalable product. Companies like Mailchimp, Basecamp, Sumo, Kissmetrics and Close.io have all started by selling marketing, design, development and consulting services to generate revenue, gather feedback from their customers and later build software on stronger foundations. The best way to validate a startup idea is through presales. Jono is building a startup to address some problems faced by managed service providers (MSP). An MSP is someone who manages a company, department or unit’s IT infrastructure. They’re the experts who make sure your company’s IT works. Prior to this venture, Jono was an analyst at one of the top global banks. During his employment period, he noticed the importance of MSPs for every company that relies on IT to run its operations. He also noticed how far behind is current technology and innovation to help MSPs do a better job and grow their businesses. Jono wrote the report to gain deep insights about the space. Little did he know, he also accomplished one of the most critical steps in the presale process: building trust with your target customers. Before we move to the next stage, defining and finding your ideal customer, notice how Jono found an idea he’s passionate about by noticing the struggles of people he worked with, exactly how Mailchimp, Basecamp and all of the examples I shared above started evaluating solutions. Jono wrote a report, Steve created an online event. Steve has been a farmer for close to 40 years. For the past 2 years, he’d been trying to enter the digital space to offer digital products, coaching and consulting services. Steve had endless questions about defining a product or a service, delivering the solution, building an audience, branding himself as an expert in the space, etc. 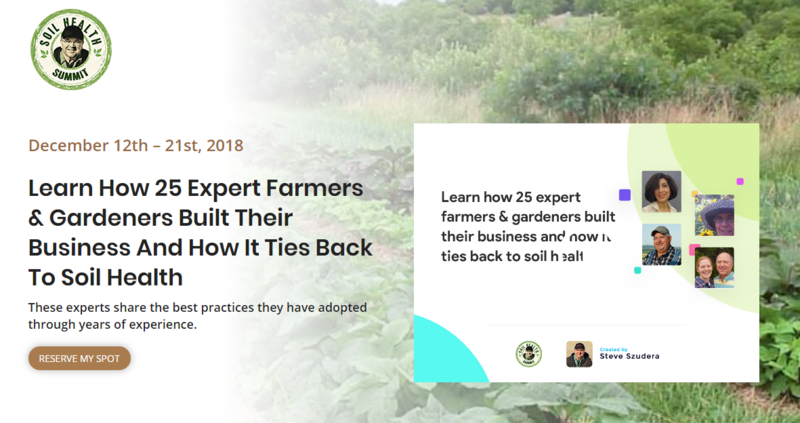 To accomplish all of the above, Steve and I connected with some of the most known and successful farmers on the market and interviewed them to create the Soil Health Summit. This project not only allowed him to build a relationship with the top influencers and experts in the space which gave him countless opportunities to ask his own questions and clarify the next steps in his online business endeavors but also, it was an opportunity for him to interact with over a thousand members who joined the event thanks to the promotion of his guests which helped him learn about their needs, expectations and goals. Ideas for digital products, consulting and coaching services came directly from his audience. As you’ll read below, some people told him exactly what they needed help with and what they were willing to pay for today even though he still hadn’t offered a product or a service for sale. “Anyone who needs help with [problem] can use my product or service.” Yes, that may be true but not a viable or wise starting point. Remember that most entrepreneurs think about their 100th customer when they don’t even have one customer. Most of the time, we think too big too soon. When you’re starting or growing, you have to focus on the most viable and quickest path to the next stage. There are two criteria by which you have to define your ideal first customers: urgency and friction in acquisition. You want to focus on potential clients that have the most urgent need for your solution. You also want to focus on potential clients with the least players, that is, few decision makers. Focusing on the first, will save you a lot of selling headache because people are aware of this problem, they are more likely to listen, ask good questions and buy. Focusing on the second means that you won’t have to get the approval of many decision makers to close the client. The less people that need to get involved in making a buying decision the better. A maximum of 20 employees. Who generate $500,000 to $1,000,000 a year and aspire to grow sales by 50% or more next year. Whose clients are worth at least $35,000 a year each to justify their investment in a lead generation professional. At the end of the day, the ideal customer profile above is an educated guess, it’s a hypothesis that needs to be tested. In the third step below, you will see how we used cold email to test this hypothesis. Listen to Jan speaking with Aaron Ross. Jono, on the other hand, had limited options. The market for MSP companies is relatively small with big companies, 30 million dollars in revenue or more. Therefore, Jono had little to no control over focusing on companies with the least decision markers. Jono needed to find the innovators in those companies. People who are always looking for the new technology or idea that can help their companies standout and grow. But since he didn’t have a product to show, we approached it differently. Like I always say, experts like to be experts, the least you can do is highlight their expertise. As I mentioned earlier, little did Jono know, he built a relationship with 30 of the most successful MSP executives on the market by asking for some of their time for an interview. When Jono approached those leaders with the interview request for creating the report, people didn’t mind getting highlighted as a though leader and took the time for the call. By the time he finished the report, he had one customer lined up. Someone he never intended to share the idea with but was very intrigued to learn more about Jono’s plans. With some early validation, we were ready to acquire our next 5 clients. As I noted earlier, our focus was on the innovators so we put a list of innovation officers and CEOs and started reaching out. The report was the ice breaker, the trust builder and the lead magnet. It conveyed Jono’s seriousness, hard work and commitment. Listen to my conversation with Ash Maurya about Jono. Farm owners who need hands on consulting work to address an urgent need. Those are consulting clients. Aspiring and existing farmers and gardeners who want to learn about building a healthy soil and growing food. Those are soil health course students. Steve’s audience helped him define his ideal customer. The Soil Health Summit was the channel by which he accomplished many goals. The third step is simply about connecting the first two steps. This is where cold email outreach plays a very important role for many reasons. First and foremost, before planning any social media or search engine advertisements, before build a lead generation machine through funnels, webinars and content marketing, before investing in any type of outbound marketing initiatives, think of the fastest way to start a communication and close the first deals by interacting directly with a sample from your ideal customers. Cold email, especially in the B2B space, is an excellent way to get a hold of your prospect. Jan, Jono and Steve used cold email to launch and presell their services and startup ideas. After defining our service and ideal customer, Jan spent some time gathering a pool of people that fall into our ideal customer profile. For Jan, it made sense to use a website like Dribbble to find the companies and the contact information of their decision makers. Having built a list of 100 companies, we were ready to start testing. Subject: It’s very important that the subject is personalized and intriguing. For Jan, after testing several subject lines, Comment about [company name] or Comment about [recent post or portfolio item] led to the highest open rate. Copy: Your copy has to be 80% personalized and 20% actionable. In other words, you should be smart in your “ask” without being too salesy. Here is how we structured Jan’s cold email in order. You’ll also find the results below. First sentence: Mention and complement a recent post they wrote or something they shared on social media. Second sentence: Note why you’re emailing them and how you can contribute to their business in addition to the work they’re doing to grow. A way to respect their efforts. Third sentence: Briefly mention how you do what you do and why it’s different. Fourth sentence: Express your interest in learning more about their work and plans. Fifth sentence: Go back to why you’d be able to make a difference. In this part, Jan wrote: One of my strengths is in securing 5 to 6 figure U.S. based clients for German companies. If there’s a fit, I’m confident that together, we’ll be able to double lead generation for [their company name]. Over the years, [quick bio about you]. Sixth sentence: Ask when they’d be available for a quick call. Seventh sentence: This one is very important. It’s a P.S. that shows you did your homework. Something along the lines of: great work on your latest project, [project name]. Loved the design [functionality, performance, etc.]! It took Jan 3 weeks from step 1, defining a service, when I started working with him to his first paying customer. Excellent results given that he’d been trying to start something for the past 2.5 yeas. Today, just 2 months later, Jan generates 7,000 Euros in monthly recurring revenue while a full-time employee. He’s very close to his “quit my job number”, something we discussed when he closed his fourth client. Jono followed a very similar approach. Since he had an extra hurdle to pass given that he is preselling an idea, my focus was on positioning him as a trustworthy entrepreneur and source of valuable and well researched information about the industry. To do that, we approached decision makers and innovation leaders in MSP companies with an opportunity to share behind the scene insights about the industry. This approach led to calls and calls led to sales. When his prospects heard him passionately speak about the industry, gaps and his innovation, they were all in. Today, 2 months later, Jono presold 9,000 Pounds for his upcoming product many months before writing a single line of code. On the other hand, all what Steve had to do was get experts and influencers to an interview. I mentioned this earlier and here I mention it again, experts like to be experts. Your cold email has to clearly note how their expertise is going to be highlighted through this interview. Two months later and 25 interviews in, Steve launched the summit and so far over 1,000 farmers and gardeners joined, connected with him and some have already asked for his services before he even offered anything. Since he had just started seriously building an online brand, our goal from this event was to get exposure, build an audience, build relationships and learn about his future customer needs. We did not want to rush into selling products or services until we build a foundation. But when people know about your value, they won’t wait to capture it. Before we conclude and summarize, there is a very important factor that will make a tangible difference in your performance with cold email. It’s your website. Your website is your suit on the web. Entrepreneurs could be homeless and yet, look like a billion dollar company online. I found that over 80% of those who answer our cold emails first check the website. As long as it’s professional and clean, that’s all you need to get started. It took Jan 2 days to create a quick professional landing page with some of the free or inexpensive website builders. First and foremost, you need an idea or a service. If you’re interested in selling services, start with your background, experience and interests. It’s the fastest way to go to market because you will control most of the variables unlike hiring people to deliver the service or learning a new skill. If you’re interested in launching a technology startup, start with your background, experience and interests. It’s still the best way to evaluate opportunities and launch products you are passionate about and can solve. Second, to define your ideal customer, research segments that have an urgent need for your product and service and focus on those who have the least decision makers to speed up the sales process. Third, hand recruit your first customers. Even if several marketing channels have proven to be effective in acquiring your customers, you should manually close your first sales. That’s what will allow you to interact with the customer, learn more about their needs and expectations and personally convey your value proposition. Above all, get started. You may be literally a week away from your first customers. There’s no significant added value from finishing a book first or taking a course or raising funds as a prerequesite to starting. The steps you learned in this guide will give you a foundation. And if you made it this far, I’d like to tell you how those steps apply to you and your own goals. Pick a date and time that best fit your schedule for a quick call.